July 6, 2018. Today on this auspicious and joyous occasion of the eighty-third birthday of His Holiness the Great Fourteenth Dalai Lama of Tibet, the 15th Kashag and Tibetans everywhere join millions of admirers across the globe in wishing His Holiness good health and a long life. The Kashag pays obeisance and bows down in deepest reverence to express gratitude to His Holiness. The Dalai Lamas are the reincarnation of Chenrezig, the Bodhisattva of compassion, and has a special karmic relation with the people of Tibet. We remain indebted to the parents of His Holiness for blessing us with their precious son, Lhamo Dhondup. Born to a peasant family in Takster village in the Amdo region of Tibet, His Holiness at the tender age of two was recognized as the reincarnation of the great thirteenth Dalai Lama. He took the reins of Tibet’s spiritual and political leadership at the tender age of 16. In the face of tragedy, with the brutal and illegal occupation of Tibet by People’s Republic of China, Tibetans turned to their only hope, His Holiness the 14th Dalai Lama. The young Dalai Lama strived for a harmonious concord between Tibetans and Chinese, in conformity with the 17 Point Peace Agreement despite it being signed under duress. However, the Chinese government repudiated the tenets of the 17 Point Peace agreement and increased repression of the Tibetan people, even posing threat to the Dalai Lama’s life. His Holiness was thus forced to escape into exile. His Holiness steered the Tibetan struggle in the right direction. Under his leadership, Tibetans have preserved their culture and strengthened their identity for the last 60 years. 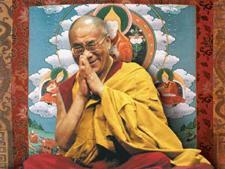 Tibetans are bound to His Holiness through a lifetime of positive karma and collective merit. In face of surmounting challenges, His Holiness established the Central Tibetan Administration (CTA) in India. Cultural and religious institutions were also rebuilt in exile India. Under the leadership of His Holiness and his vision for a democratic Tibetan polity, CTA has a unique system of carrying out administrative responsibilities democratically, endowed with Buddhist spiritual values as core components. CTA is the legitimate and democratic representative of the Tibetan people. The year 2011 was a watershed year for Tibetans. It was the year in which His Holiness announced his decision to devolve his political leadership. Today, CTA multifariously spearheads its quest for freedom with the hope to finding a resolution through dialogue with China and at the same time preparing a clear long-term vision should it continuously have to remain in exile. The four commitments of His Holiness: 1) Promotion of Human values 2) Religious Harmony 3) Preservation of Tibet’s Environment, Identity, Culture and Religion 4) Promotion of Secular Ethics and revival of the Ancient Indian Wisdom, define his vision and mission in life. His Holiness has consistently advocated for the inclusion of secular ethics- the basic human values of love, compassion and altruism in the modern education system and the development of the head and the heart. Earlier this week, His Holiness launched the Delhi Government’s “Happiness Curriculum” which will be introduced in all the 1,000 government schools in the state, from nursery to 8th grade, focusing on student’s inner health and happiness. Referring to the Nalanda tradition as ‘Science of Mind’, His Holiness the Dalai Lama continues in his commitment to revive and promote the ancient Nalanda tradition of India. He has time and again stressed to a global audience, the importance of studying the ancient Indian wisdom based on the teachings of the Nalanda tradition and its classical texts on psychology and dialectics. Moreover, His Holiness the Dalai Lama has for the past 30 years met with eminent scientists to initiate significant discourses, predominantly on Buddhist philosophy. This has resulted in many things scientists taking interest in the same. These discourses have led to the ‘Mind and Life’ conferences and the establishment of the ‘Mind and Life Institute’. His Holiness the Dalai Lama remains steadfast in his commitment to preserve and promote these ancient Indian traditions and thoughts. In recognition of His Holiness’ untiring efforts to serve humanity, he has been bestowed with more than 150 awards, including the Nobel Peace Prize, the UN Earth Prize, US Congressional Gold Medal and the John Templeton Prize to name a few. His Holiness’ unwavering and unquestioned love for every sentient being is like that of a parent’s love for a child. We owe him a debt of gratitude and this can never be paid even in a hundred eons. Our devotion and faith in him will remain unparalleled. Therefore it is of utmost importance for each and every Tibetan to put into practice the invaluable advice of His Holiness. 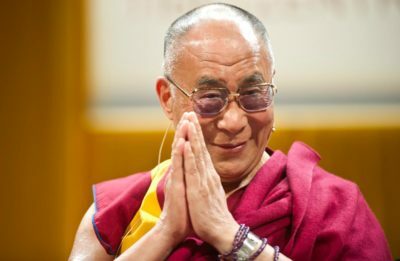 Recently, an unfounded speculation about His Holiness the Dalai Lama being terminally ill went rife after an unverifiable news article published about it. This did raise concerns among Tibetans as well as his followers and well wishers around the world. Today, we take this opportunity to assure everyone that His Holiness is healthy and keeping very well. There is no room for worry. On the recent meeting between US President Donald Trump and North Korean leader Kim Jong-un, His Holiness the Dalai Lama issued a statement welcoming the initiative and stressed on his firm belief that dialogue is the only way to resolve problems, whether between individuals or nations. In this light, we urge the Chinese government to resume talks with the envoys of His Holiness the Dalai Lama. Taking this opportunity, the Kashag strongly wants to reiterate that we are not seeking independence. We remain firmly committed to the Middle Way Approach, seeking genuine autonomy for the Tibetan people under the framework of the People’s Republic of China. The Middle Way Approach is based on the principles of non-violence, truth and reconciliation, one that seeks to engage with the People’s Republic of China through dialogue and enable Tibetans to preserve their culture, language, environment, identity and religion. At the heart of this approach is the steadfast resilience of Tibetans inside Tibet, who are both the driver and the amplifier of the Tibet movement. Human rights violations are pervasive in Tibet. The systematic and severe human rights violations continue to be committed in Tibet under the authority of the Chinese government. Tibetans in Tibet continue to face social exclusion as well as political and economic marginalization. In sheer protest against the subjugation and oppressive rule of the PRC, till date 152 Tibetans have self-immolated. All of the self-immolators have unanimously demanded the return of His Holiness the Dalai Lama to Tibet and basic freedom for Tibetans in Tibet. 130 of them lost their lives. Instead of addressing the legitimate grievances of the Tibetan people, the Chinese government has instead resorted to criminalization of self-immolators and their families. Any act or opinion that is not to the liking of the Chinese government can be met with severe consequences and punishment. Tibetans in Tibet are denied their most basic and fundamental human rights enshrined in the Chinese constitution. Tashi Wangchuk, a Tibetan language advocate calling for the rights of the Tibetans to learn their own language was sentenced to five years in prison on charges of “inciting separatism.” Tashi Wangchuk has appealed against his 5-year prison term. We support him and firmly reiterate that advocating the language rights of the Tibetan people as per the provisions in the Chinese constitution is not a crime. While we strongly urge and hope that he will be released soon we also express our sincere gratitude to all those who have advocated for his release. The resolution affirmed the US Senate’s support for the Tibetan people’s fundamental human rights and freedom. It further called upon the US Ambassador to the People’s Republic of China to meet with the 11th Panchen Lama. Similarly, a statement issued by the US State Department reaffirmed the commitment of the United States to call on the Chinese government to release the Panchen Lama who was abducted by the Chinese authorities at the age of 6, making him the world’s youngest political prisoner at the time. The Tibetan non-violent struggle for freedom has gained the support and solidarity of peace and freedom-loving people and governments around the world. On this most special occasion, we extend our deepest gratitude to the citizens and Government of India for their continued hospitality and unflinching support towards the Tibetan people. We also express our sincere thanks to all the friends of Tibet and freedom loving people across the globe who support the cause of Tibet. Finally, for the benefit of all sentient beings and particularly on behalf of all Tibetans, we pray for the long life of His Holiness the Great 14th Dalai Lama of Tibet. May all his wishes be fulfilled. We hope and pray that the non-violent cause of Tibet will prevail.